Alright! Time to bring back the metals! Well at the very least try to do more blogging! The last few weeks have brought some excellent bands to the Boston/Worcester area, I'd like to share one of them with you. Humanity Falls is always a welcomed band in Boston, playing at least once or twice a year to lineups including some of the best death/grind bands of the area. I'd call myself a fan as well, enough to drag me out to Everett to see them arrive fashionably late. Just in time to annihilate the crowd with their one of a kind chaos. Chaos is a great word for this New York based band. This music isn't for the weak of heart, it's fast, loud, chaotic, dissonant, jagged, brutal, obnoxious, irritating, almost completely devoid of an traditional sense of music. Guitarist, Ammo Diaz, sounds like he's just smashing the guitar, rubbing his hand up and down the strings and playing just random notes. Well, he kinda is! There is method to this madness, one can tell that it was thought out and planned to the letter. There are "traditional" death/grind riffs thrown in to the mix for the headbangers and moshers to go to town. Edward Bednarek is a beast on the drums, blasting at both speeds & rhythms that are unimaginable. The snare has a clanging ringing trash can like sound to it that adds to the deranged music. Then the final piece of the puzzle is Eston Brown's ferocious & totally brutal vocals. Powerful & harsh, he's no slouch providing both low end growls and raw grind screams. 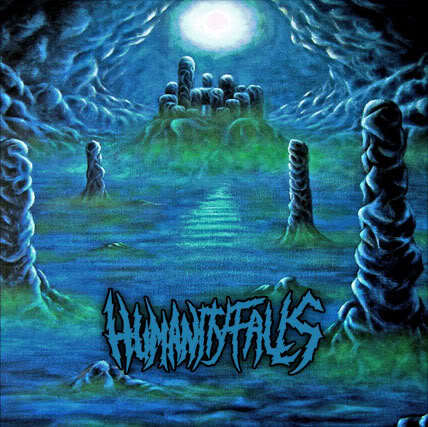 Humanity Falls is definitely not for everyone, but those with an open mind and a love for chaotic music will get a lot of out of this band. Check it out!